The amount of furniture in your home can influence your peak heating or cooling load and when it occurs. In general, having more furniture (and larger individual pieces) decreases the load, making your home easier to heat and cool. Materials furniture and other contents are made from play a role in how hard your HVAC works to make your living space comfortable. Materials that absorb solar heat entering through the windows, for example, can add to the HVAC's summertime workload, so it uses more energy and takes longer to cool your home. The thickness of your wall materials and flooring impact your HVAC system performance. Thicker materials that don't absorb a lot of heat have a lower thermal mass, and help reduce heating/cooling loads. Window treatments can also affect the amount of heating/cooling your home needs. Tight-fitting cellular shades, for example, can block up to 85 percent of heat gain in the summer, and reduce winter heat loss by up to 40 percent. The placement of your furniture and decor items can negatively impact airflow through your HVAC system. Furniture or window coverings that block registers or return grilles, for instance, can cause a decline in airflow that puts unnecessary strain on your HVAC equipment. Over time, airflow problems will adversely affect the equipment's efficiency, reliability and lifespan. 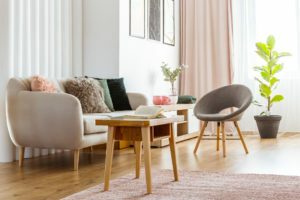 Many common components of furniture and interior finishes release potentially hazardous volatile organic compounds (VOCs), which degrade the quality of the air cycling through your HVAC system. The possible culprits include paints, stains, flooring, carpeting, textiles, and furniture glues. For personalized advice on ways to minimize problematic HVAC effects in your Fort Wayne home, contact us at Hartman Brothers Heating & Air Conditioning.